Posted on October 8, 2015, in Current News, Uncategorized and tagged Chesty Puller, History, Korean War, Marines, Military History, nostalgia, USA, USMC, veterans, WWII. Bookmark the permalink. 75 Comments. Thank you, Don. I appreciate you helping to share the story. I certainly hope this works out for the Marines. It sounds like a great idea, but funding so often gets to be an issue as it needs to continue after the initial cost is satisfied. What a great tribute to Chesty Puller. I don’t usually include stories about any types of funding – even for myself. But this man was so loved and admired by his men, I felt those veterans should know about this. This marine was mentioned quite often when I did my Korean War posts. I hope it helps as well. All the best to the Marines in purchasing Chesty Pullers home, a great iconic centre piece for all Marines to recognize as a Home base. Chesty Puller certainly had a sense of humour, which only an Officer in the Marines could, with that snippet from his past re the Chinese count. Well done again gp, on a great informative post. Thank you, Ian. You can definitely appreciate his humor, eh? He was a man that all services admired and respected. Oh, isn’t that just great!! Thanks – You know me very well, don’t you, Ian?! That is a fantastic link – I hope everybody takes a peek in at it!!!! I like his idea of counting. I’m sure they will appreciate your help. Thank you for helping the troops. I know they will appreciate this. Great project. I’m hoping it get out far and wide and is successful. Love the Puller anecdote as well. Hope you are doing well these days…keep up the excellent work. Good to think these combatants are not forgotten and neglected. All success to the venture. Thank you, Maureen. I appreciate your concern. I appreciate your visit, Curt. A Marine’s Marine , for sure . The project seems especially appropriate and I hope it works out . Thanks for sharing. My pleasure, Dan. Thank you for coming by. Great story. Hope all goes well. I do as well, thank you. I couldn’t resist posting this – hope it helps them in some way!! Thank you for helping out, Penny. Danke, Gislinde. Ich hoffe, dass Sie sich wohl fühlen. Such a beautiful home, thank you for sharing. My pleasure. I hope they accomplish their goal! I’m passing this on to a Houston radio talk-show host who’s been deeply involved with Houston’s Camp Hope, a home that provides shelter, drug and suicide prevention counseling, and so on for veterans suffering from PTSD. His audience and social media following is huge, and I have no doubt this will get a mention or two. With luck, it will bring in some contributions, too. I don’t know quite how to thank you for passing this article on to such an audience. Every little bit contributed will help in the purchase. I’ve heard of Camp Hope and that is a very worthy cause. Corporal Wawrzyniak (much later a Lieutenant Colonel) received two awards of the Navy Cross for his service in the Korean War. A “Puller kind of Marine,” with whom I was honored to serve. What a great story, Mr. Madison! I thank you very much for sharing it. As I’ve told other people, I’ve never heard a bad word against Puller, a reall Marine’s Marine!! I appreciate you taking the time give us this tale! A real soldier in real wars, sounds like quite a man! It’s not just Marines who admire him. Thank you for coming by, Beari. What a fabulous plan! I do hope they’re able to pull it off. You and me both, Linda. Thank you for reading; I hope you enjoyed the man’s humor. What a fantastic idea and hope that they can purchase the home. Great effort and so worthwhile!!!! With any luck and determination!! Here’s hopin’!!! 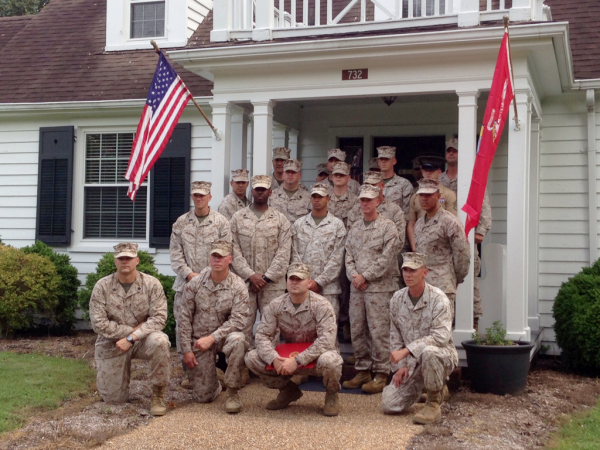 They have the determination and love the idea that a Marine would have a home to go to. Too much red tape nowadays! NOW – isn’t THAT the truth!!! Important stuff … unlike that bozo Jenner! Thank you for passing this on, Koji. Perhaps the more people who see it, the quicker the guys can buy it up!! Beautiful post. People pulling together to secure a sacrament, a reminder that they continue to stand strong, as well as to offer homage as a site to be used for more festive venues as well. Gap Cox, I received a blog post today that I would like you to look at. Can you send me your direct site link to: grapevinetexas at dot me dot com? I think it would be easier if you just copied and pasted a link to it here. I would greatly appreciate that. I wanted your thoughts on this. I don’t usually like to get into political discussions, mainly because I simply do not trust any politician – in either party! But it is true that Obama gets pretty hot under the collar when he’s disagreed with, enjoys making his own rules [simply because he can – no one seems strong enough to stop him] and has no idea what the military is for except to be his own chess men, moved on the board at his will. I, personally did not like the pres. the first 4 years, felt he was just not qualified and heard a few lies during his speeches, but ever since his re-election – I find his actions illogical, overly defensive and narcissistic. I hope I haven’t offended you in any way, but I am personally very concerned for this country. I will probably not live to see the end of the USA, but I worry for those younger than I.
I simply could not believe what I was reading. This was sent to me by my brother, the Veteran. It was sent to him by a Veteran. Again, I appreciate you looking at it. No problem. It never hurts to ask!! What a wonderful idea. 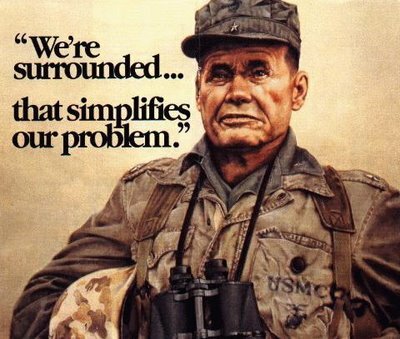 Chesty PUller is up there with Eugene Fluckey on my list of amazing military minds. You picked a good one there, Jacqui! RAdmiral “Lucky” Fluckey received a Medal of Honor and 4 Navy Crosses. One of the best to ever board a submarine! They break the mold after making such men! The Marines following are a new breed in a new world. To be honest, I can’t be certain where that statement first originated. I do know it was the title of a book of letters from the Civil War and a statement made in the movie, “We Were Soldiers,” about Vietnam. Thank you for your curiosity, Marcey. Great mission! I will spread the word for contributions. Wouldn’t that be something if we helped?!! Absolutely! I’m notifying a Marine buddy to check your website today. He has wider contacts than I to pass this to a supportive community. Fantastic!! Thank you for your time and efforts, Sammy. You bet. Also posted on my Facebook page. Now headed to gofundme to see about making my own donation. Isn’t that great!! Just a little bit from everyone would make a world of difference! 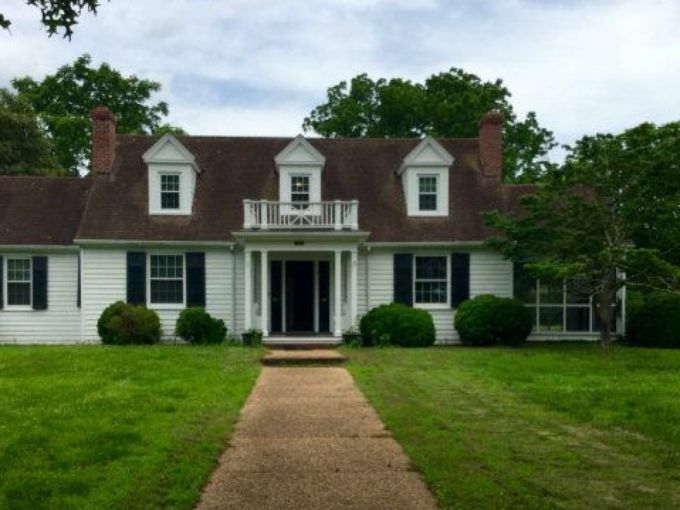 That sounds like a great way to make use of this beautiful house. Isn’t it?!! I couldn’t get the idea out of my mind – so – I made a post of it!! Here’s a tiny opportunity to do something very big. Thank you for helping to share! What a great project. That seems like an amazingly reasonable price for the property. Hope it all works out. I really hope that this worthy venture succeeds. Me as well. I thought this a heartwarming story for a change. This looks like a great thing to do for all the marines over there. I am sure that they will raise the money soon, and hope that they achieve their goal.I have no doubt that Chesty would approve too. I didn’t need to look for USMC cartoons, Puller had his own humor!! Thanks for stopping in, Pete – always a pleasure! What an awesome effort to memorialize the home one of my personal favorite Marine Generals of all time. 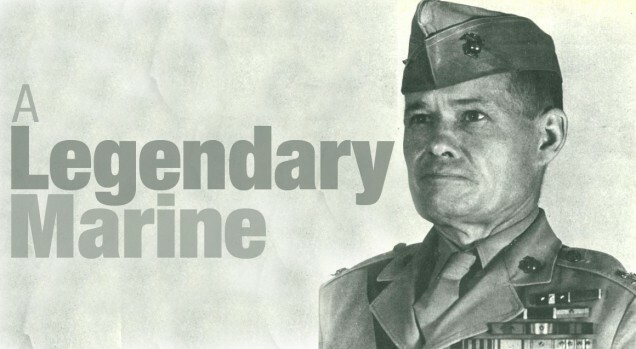 While in the USMC, Chesty’s legacy and shadow loomed large..he inspired so many Marines to keep charging forward. Semper Fi Chesty! I’ve never heard a Marine say a bad word against him!! It is that sentiment that prompted me to make this post.